Text flowed into a path with the shape of an old Chinese coin. The path consists of both the outer circle and inner square. To create a linked flowed text object, select a text object and one or more shape/path objects. Then use the Text → Flow into Frame (Alt+W) command. If multiple shape/path objects are selected, the text will flow into the last object selected first. 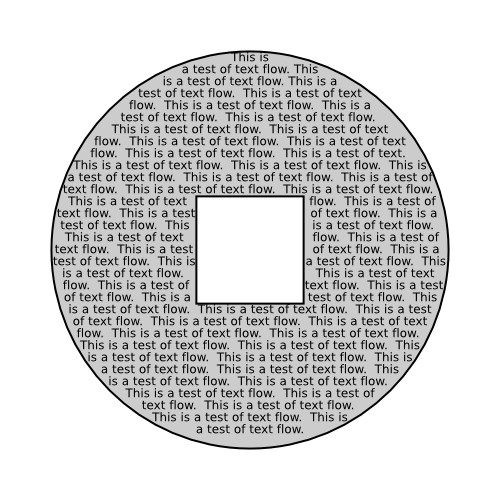 Text flowed into three circles. The circles were selected from right to left so that the text would flow first in the left hand circle. Flowed text can be edited in place, including selecting part of the text and changing the style or changing the letter and line spacings. The center circle above has had some adjustments made to the style and the letter spacing. To select all the text, use Edit → Select All (Ctrl+A) command while a text object is selected with the Text Tool. If the flowed text is selected, the Edit → Clone → Select Original (Shift+D) command will select the first shape or path object (especially useful if the path has been made invisible). Tab will then rotate the selection one by one through any other shape or path objects that are part of the linked-flowed text object, as well as the text itself. Flowed text can be converted back to a regular text object with the Text → Unflow (Shift+Alt+W). The resulting text will be on a single line. The Text → Convert to Text command converts link-flowed text to a regular text object while preserving the appearance of the text. The text is still editable but will no longer reflow inside the shape or path frame. This is necessary for display of the drawing in another SVG renderer.